An elegant appliance that is convincing due to its superior workmanship and elaborate technology. Thanks to its electronic menu control, 4 different brewing temperatures can be set and the steeping time can be individually adjusted to the type of tea used. Whether black tea, green or white tea, whether teas made of fruit or herbs – this fully automatic tea maker delivers aromatic results for each taste. Preparing perfect tea is made easy: fill in water, put tea into the tea strainer, select the program according to your type of tea and – if required – adjust the steeping time; the automatic tea maker will do the rest. The water is heated and directed into the filter jug to infuse the tea. Once the set steeping time has elapsed, the brewed tea flows into the aesthetic glass teapot where it is kept warm. The convenient start time preselection, the automatic switch-off and the easy cleaning due to superior materials make the handling very comfortable. Also the demanding tea drinker will love this superior Rommelsbacher brand appliance! While filling in, water is slow to run into the water container. What can I do? It takes 20 seconds on average for 1 l of water to run through the inlet valve into the container. 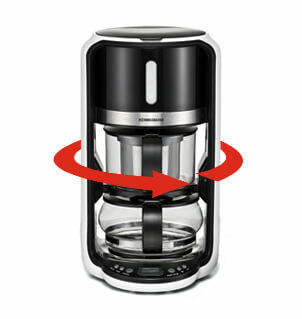 If you feel like the process takes longer with your appliance try descaling it. A detailed instruction on how to descale can be found in the instruction manual which can be downloaded here on our website. Some water remains in the water container and does not run through into the filter jug. What can I do? Please descale as described in the instruction manual, which can be downloaded here on our website. Can the duration of the keep-warm function be altered? The duration of the keep-warm function is strictly set to 30 minutes and cannot be altered. It cannot be prolonged by removing the jug. According to the European Energy Saving Regulations the keep-warm function of appliances of this type is limited to max. 30 minutes. In what time intervals can the steeping time be altered in manually? Steeping time can be altered in ten second intervals in between 10 seconds and 10 minutes. Can the appliance be used to make tea from tea bags? Yes, simply place tea bags with pre-portioned amount of tea into the tea strainer. Ideally for this the tea bag tag should be removed to avoid coloring from getting into your tea. Are the parts that come into contact with the beverage BPA-free? The appliances jug is made from PC. Migration of BPA in parts made from PC are determined as part of the LFGB-testing (German Food and Feed Code). The maximum value permitted is 0.6 mg/dm³. For our PC parts values of less than 0.05 mg/dm³, have been determined which is below the limit of detection. What is the appliances min. /max. filling capacity? The minimal filling capacity is at least 0.4 l. The maximum filling capacity is 1.0 l.